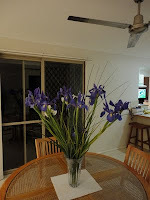 I love Iris's and they always remind me of my nan's garden when I was a child, and then of my own garden in the Central West of NSW. 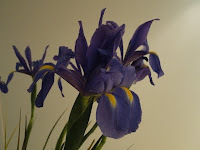 We had huge frosts and the climate was perfect for bulbs of all sorts, and every winter I had a brilliant show of Iris's, Daffodils, John Quills, and any other winter bulb you could imagine. My front garden was an absolute riot of colour and I used to love nothing more than to sit on the front patio and admire them. On Monday a good friend bought me some Iris's to cheer me up as I had not been well and here it is the end of the week and they are still going strong. 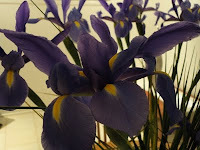 I couldnt resist taking a pic of them to share with you. There is nothing like fresh flowers to bring the great outdoors in and they certainly do cheer you up!